You are here: Home / Musings / When the Sky Opens Up…..
Labor Day weekend was pretty much a washout. Saturday and Sunday I had thunderstorms with torrential rains and lightening. Total rain for the two days was almost 5 inches, and each day it came down in a short amount of time. The consequences of the storm? I lost my internet. OK, reboot, no big deal. It ended up being a big deal. This is a post where I will rant for the first time on my blog. Not because I lost internet service, but because of the way restoring it indicates how corporate America is becoming increasingly more arrogant, even when they have been incompetent . After all the normal checks, reboots, it was obvious I was going to have to call the telephone company and arrange for a repair. It was late Saturday night, so I waited for Sunday and called. I ended up calling 3 times, listening to all the options and getting disconnected several times and never made a live person contact. Then I called and could only get Spanish…..now I was losing my cool. English first option please, and preferably the only option! On the fourth time I got connected finally to a live person after having to go through several minutes of press this, then that, you know the routine. Pressing “O” did not work. I get a live person, he makes me go through all the stuff I told him I had already done, and then he says, yes I guess you have a problem because the static on the line is horrible, so we will have to fix that first before we can fix the internet. He gives me a work order number and then says hold, and before I could say, “no” what I knew would happen did……we were disconnected! He never called me back. Now I know they have my number because they ask you to punch it in several times, and then when you get to a person they ask you again!!!! OK, I figure I have a work order number, and it is supposed to be done, but when I called back because it is not working, the same try 3 times to get to a live person leads to multiple disconnections, AGAIN!!! The recording says “your repair ticket is closed”, i.e. the line is fixed, NOT! I couldn’t get to a person. And on the robo response, they tell you to use the internet for a live chat. Mind you, I am on the phone robo service line request for internet repair!!!!! I looked on my bill, got a different number to try, and eventually got to a person. Number of disconnects before I did…..try 4. The person checked the line, and said, yup, you need repair, and issued a work order and gave me the reference number, and he tells me that it will be done by 7:30 Tuesday (this is Sunday), and I said you have to be kidding me. Nope holiday. I was also told that someone had to be there and available from morning until 7:30 pm. Tuesday comes and goes, and it is now going on 8 pm and no repair. I call repair at 8, reaching a live person this time after only two disconnects. I had to repeat everything, and he says, well, let me check with the service department, I have to put you on hold. Guess what? You got it…….I am disconnected. I get back to a person, have to repeat, and I am told that I am 6th in line for tomorrow, which will be Wednesday. I was furious. I waited around all day on Tuesday. If they knew they couldn’t come, a phone call to that effect would have been nice. So I wait until mid afternoon Wednesday, and he tests everything and say, yup, the modem is dead. He replaces it and leaves. It initially showed that it was working. Well, as soon as he pulled out of the driveway, it didn’t work. I tried to chase him down the driveway but he was already gone. I called repair and I get someone who seemed competent. He checked the line and said, yup, not working. He says he was going to put me on hold (OMG,NO!) in order to call repair and see about getting the serviceman back. Well, I was not disconnected, but was on hold for quite a length of time. When he came back he says he talked to the repairman, and he, the repair man, says to the tech support guy, who says to me, that the repair man failed to tell me that the new modem handles a higher megabyte than the lines in our area can handle, so there needs to be an adjustment by the service center!!! He never said a word or arranged to do that. So while I was on hold, again, this tech support rep was able to get that taken care of. However, it still wasn’t working. Well, the repair guy also never said that the new modem had built in WiFI so we didn’t need ours, and because he had connected it back to the modem, the modem was struggling and going back and forth. OK, unplug that, and it still no internet. When I checked to see what network the modem was trying to connect to, it came up…..password needed!!!! The service guy never put in or mentioned that a password needed to be put in. I told the tech support guy, and he said turn the modem over, and use the numbers from a certain line. I did, and after rebooting and waiting, it finally worked and I had internet. So that is how I spent almost five days…..no internet, and disgusted. Of course I couldn’t post. That was frustrating. So what did I do with no internet (or TV as we use Apple TV). I organized and cleaned some. When you are waiting for a call, running a vacuum cleaner makes it easy to miss a call. 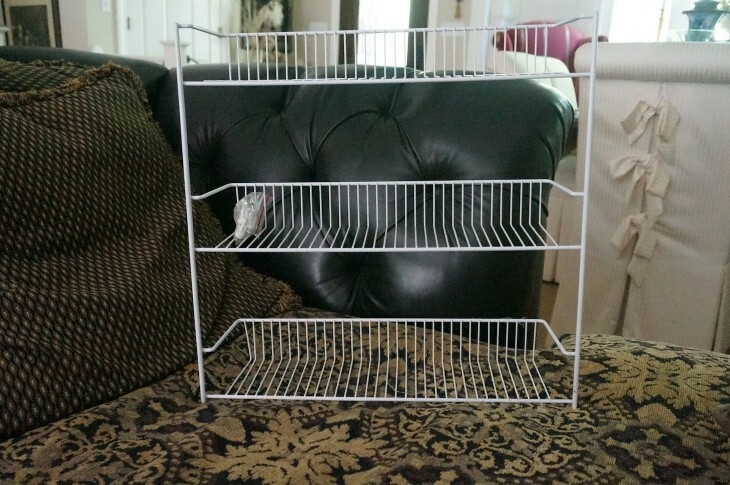 So first I went into the garage and came across this shelf. 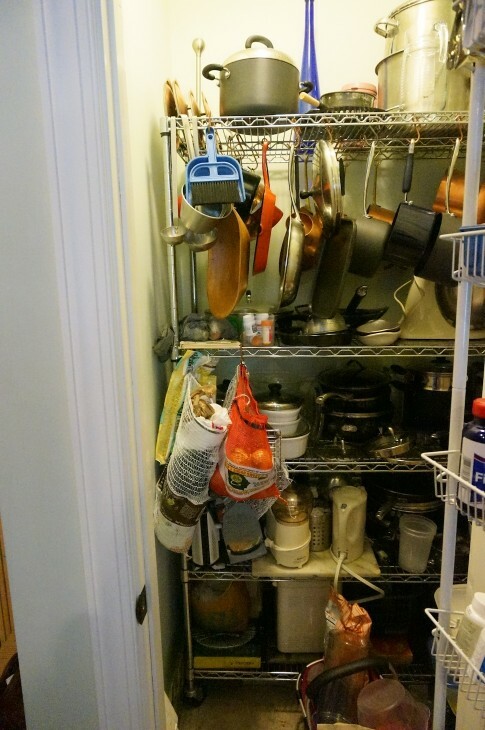 I thought, ok, I will put it in the pantry. Little vacuuming needed. Should have been an easy and quick project. 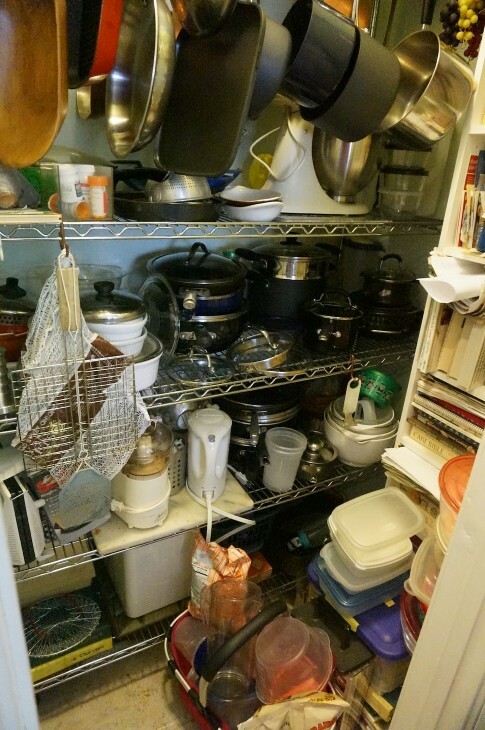 But really, is there ever a home project, especially an organizational one, and especially one in the kitchen, where in order to do the specific project, you have to do another first, which means you have to do this as well, and on and on. Such was the case. 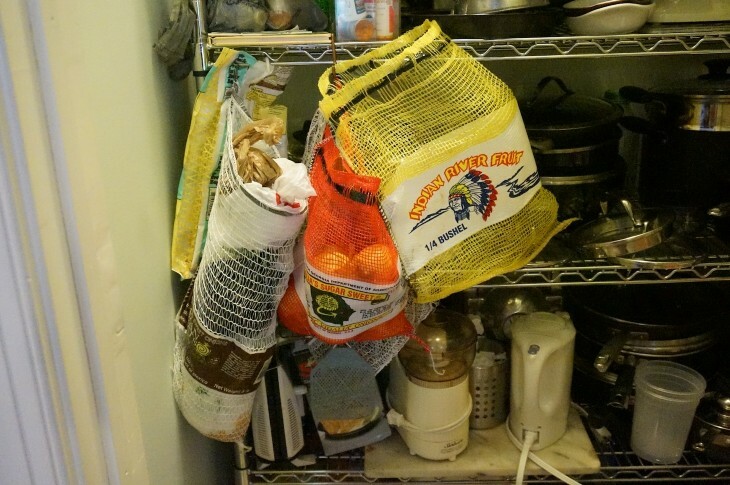 For years, or so the bags with dates on them would indicate, I have neatly folded up various shopping bags and slipped them neatly along side the stainless shelving in the pantry. 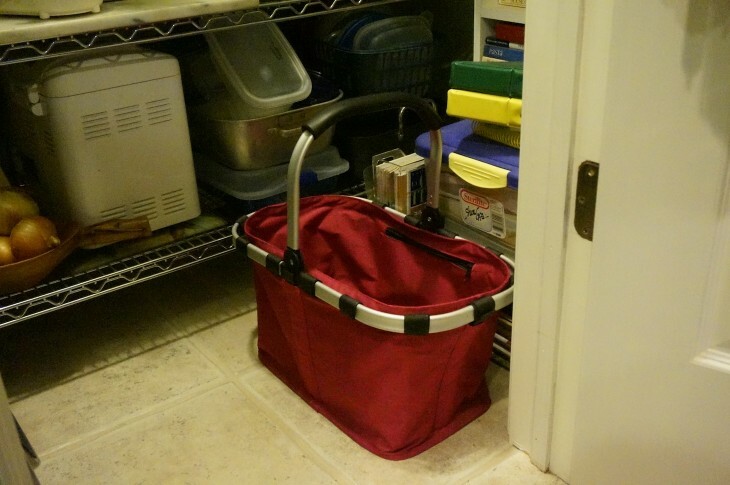 A narrow space, but perfect for storing a few bags and then having them handy when you need one. Well, I guess I haven’t needed one for a very long time!!!! Can you believe this……it’s funny how a “few” grows into “a lot” without realizing it until you have to push with Herculean strength to get “just one more bag” and oblivious to the fact that there were now more than too many bags there. Well, there sure were……more than 125. 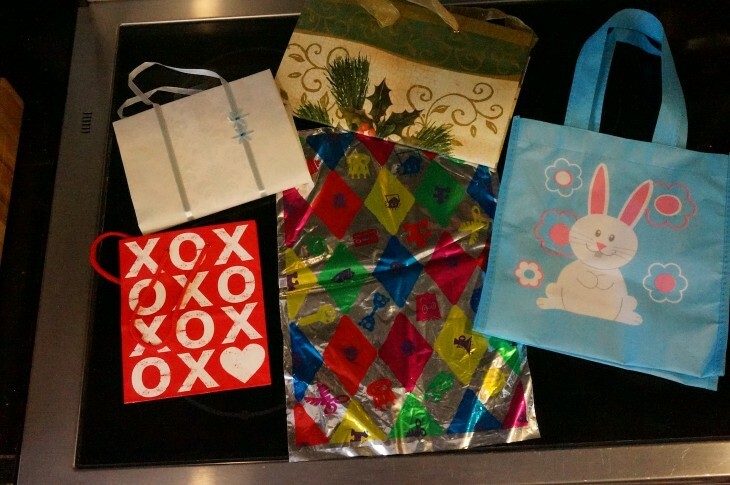 I recycle the grocery store plastic ones immediately, but these kept ones were nice bags, definitely reusable, with twine or plastic handles, and some were pretty enough that it would be criminal to just throw them away. The bags were stuffed all along the left side, against the wall. Wished I had taken a before photo. the pantry needed some work. 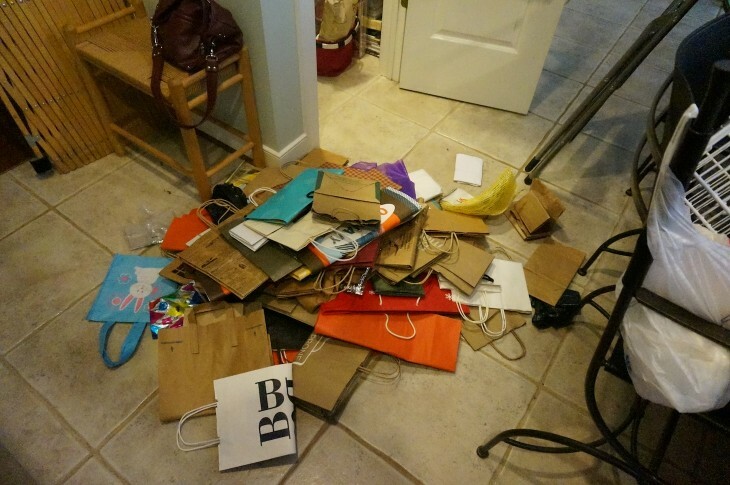 The bags were already on the floor, photo below. 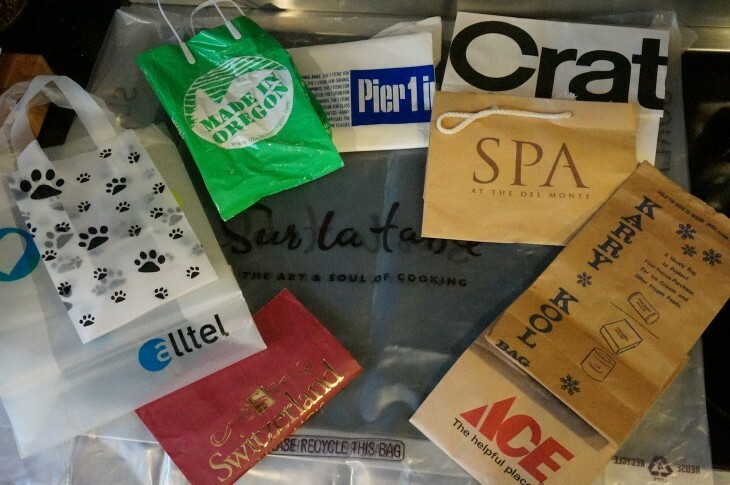 As I sorted them, and organized them in a way such that I might now use them, I was amazed at the variety of places I had been to or had shopped at. I don’t remember that I ever walked in the doors of a few! 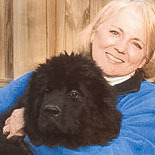 There was the small bag with my veternarian’s label on it and marked “Annie” June 2005″. Annie was a beloved shaggy rescue that lived to be in her late teens, and the bag held the can with her ashes in it. Why did I keep this bag? There was a couple from Oil & Vinegar, a wonderful store that sells specialty gourmet oils & vinegars. Very cute bag. And then there was the one from a shop in France that Keith carried on the plane so my gift wouldn’t get wrecked. Then there are the Pottery Barn, JJILL, the orange ones from an antique store I frequent for bargains, and a myriad of others. It is apparent that I will never use them, or all of them, at least in this lifetime. There should be a place easily available to recycle these bags……like there is for the plastic. To depend on the recycling of my garbage collector seems a bit odd, but I guess, painful as it is, I should discard most of them. The one on the far right is for keeping ice cream cold on the way home from the market…….when did they last do that? If my cousin EC were here while I was doing this, she wouldn’t ask me…..”do you really need that?”, she would have said…..”give me that, you don’t need it, not now, not ever!” She is an expert at getting it down to absolute basics in a good way. So, with her voice ringing in my ears, I completed this task, the bags are going away! Well, most of them are. 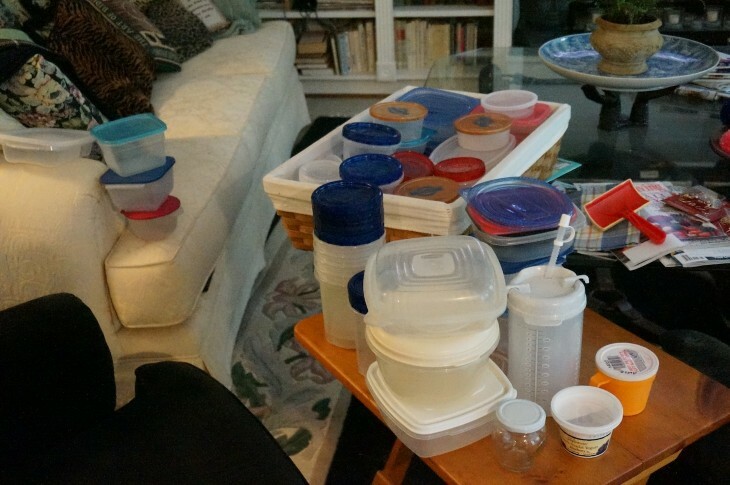 So now I see there is an overflow of plastic food storage containers. Time to sort and toss. They are both in my market basket, and in a basket under the island. I pull them all out and have a go at it. This is only part of them….the rest are on the island behind me. 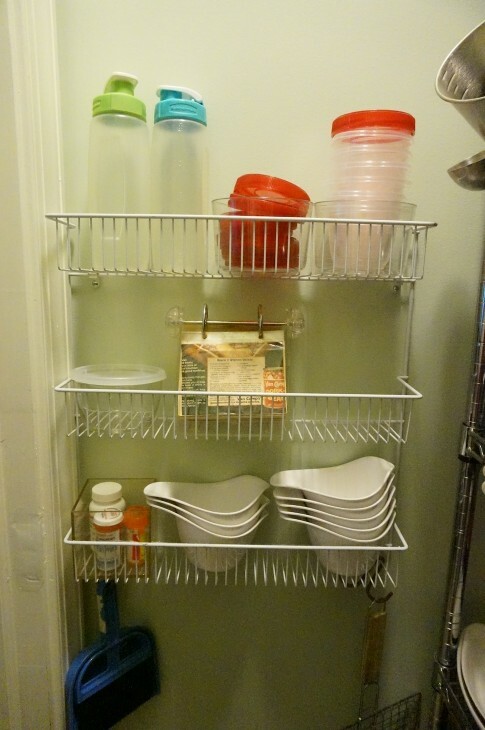 The pantry is getting to neat and orderly again. I recycled a lot of these containers….They have been whittled down to a few of each size and the rest…..out the door to recycle. I have started switching back to glass for food storage anyway. 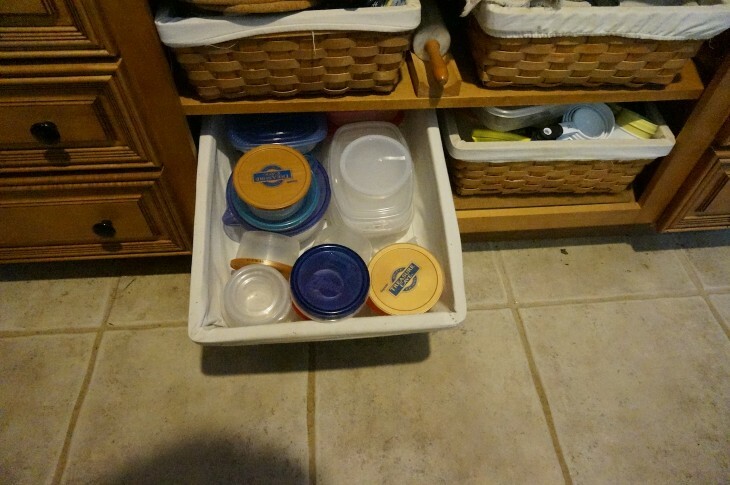 These plastic containers are like socks in the laundry….does the washing machine eat the missing sock? Why does it only eat one of a pair? The same for the plastic conctainers….how do you end up with missing tops? I know I never threw any away? Where do they go? I think perhaps there are laundry and pantry potergeists. When we were kids and got asked a question about something that was missing and its whereabouts, we usually answered “the poltergeist did it”. Around here, in the laundry we blame it on the laundry fairy. Anyway, a whole lot had missing tops, so out they also went to recycling. 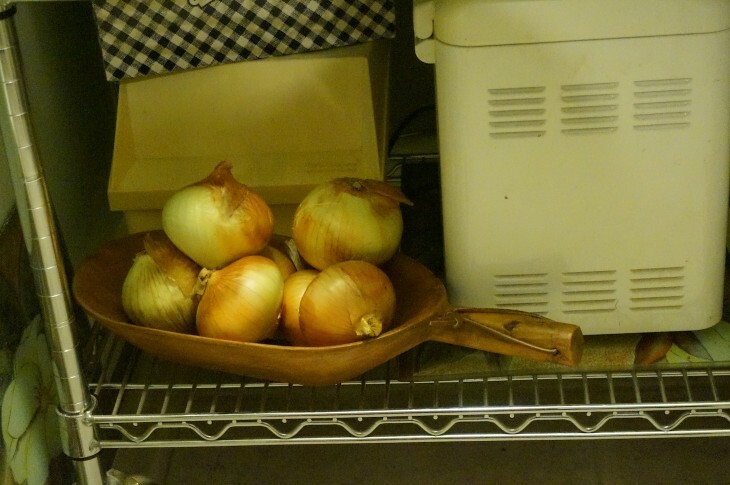 OK, I still haven’t hung the shelf, so I decided that after rearranging the pots and pans, clearing out most all the containers, that I now had space for the onions on a shelf using a small antique dough bowl that I really like, instead of hanging them in their bag and making it difficult to access cooking items behind the onion bag. And look, more bags! Well, I can’t believe I shared one of my messy pantries with you. Two years ago it was pretty neat, the last time I sorted through my pots and pans and narrowed it down to my favorites and donated the rest. At that time I did not sort and scrap the side bag storage. 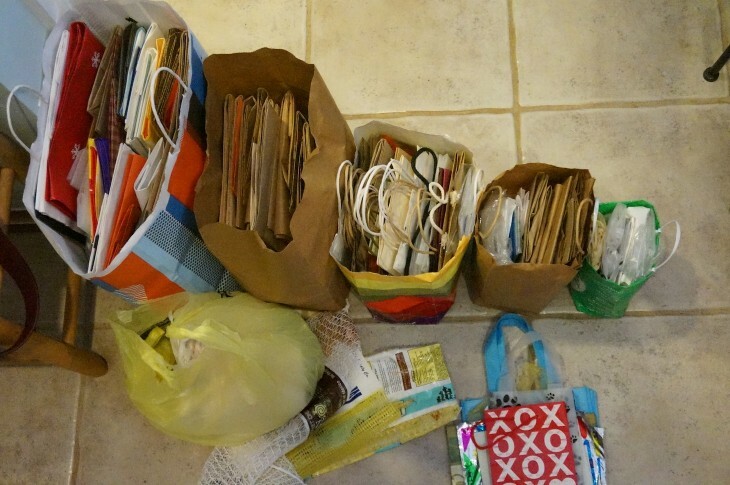 Now the only thing left to do is sort and keep only my absolute favorite cookbooks. 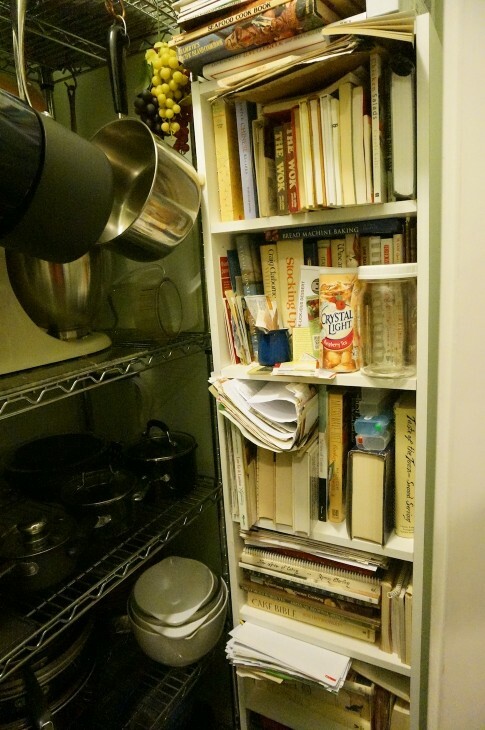 I have more than 200 cookbooks, a few you can see below, and the rest are in the other larger walk in pantry in the laundry room. I find that many of my favorite recipes I have already scanned and are now on the computer, or in my rolodex recipe file or committed to my head. Once I do a new recipe, I tweek it and rarely go back to the cookbook. Now, I do have favorites that I enjoy reading, and I will keep those along with some that have been passed down from my parents and grandparents with personal notes inside. I really need to do that soon. 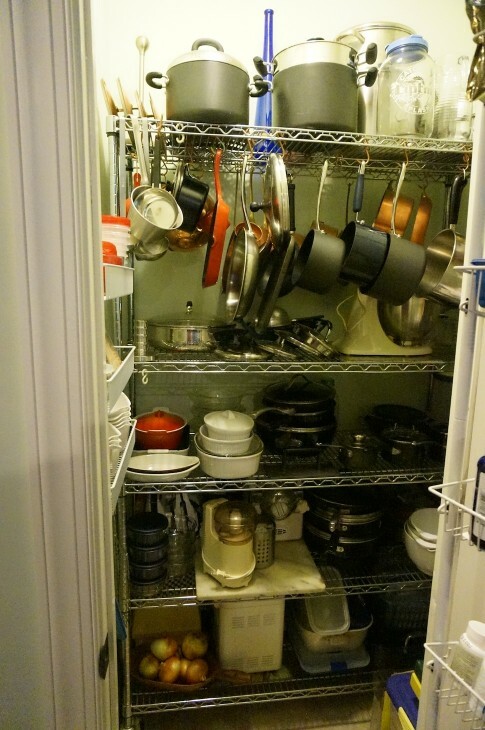 I am really committed to downsizing most everything…..and it really feels good to do so. Thanks. Takes longer than expected but it was easier to toss a lot of the stuff this time. I just said to myself…..”here take that you stink’n communications company”, as I threw the containers into a bag, and here, take it again and again!!! LOL. Those ladies in the top photo would never have disconnected you the way the current company did. And it seems to me they had so much more to keep track of. My sympathies. Remind me to tell you about our satellite company debacle sometime. Enjoyed seeing your reorganization. I’ve done some of that, but every time I turn around, I need to do it again. No, they wouldn’t have disconnected us, and they spoke English! And yes, reorganization is ongoing….but for me anyway, I really feel good when I have scaled things down and can really see the results and finding things is so much easier. Sorry to hear about your satellite problems. I had DISH for a few years and discontinued it. Don’t miss it at all. Bang up job on the pantry…laughed when I saw a bag that came from us…. I have no idea why I put gift bags in the pantry! I have an area downstairs for those and wrapping paper. Go figure! I could identify with you for this week was on the line with my internet supplier and went through a similar situation. So frustrating and the amount of time I spent on the phone. I was speaking to someone I believe that was in India or Pakistan! Oh, I can so relate to what you had to deal with. I am really a pretty patient person, but these kinds of things can trigger my frustrations levels to sky high. I am looking forward to hopefully at least getting rid of the land line, and finding an alternative to using the phone company for anything. I am fed up with people & robo calls, even when I am on the do not call list. A phone should be a convenience, not a nuisance and same goes for the computer. Can’t even get the news without a ton of pop up ads. I hope that you were finally able to resolve your issue at least. Thanks for stopping by Marlene.